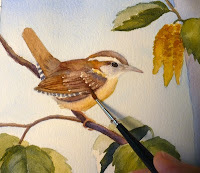 One of my collectors loves wrens. I don't blame her, they are sweet little birds and one of my favorites too. She has commissioned paintings of wrens for each of the four seasons. This one is the final one of that collection - she likes birches and asked for a wren in a birch tree. 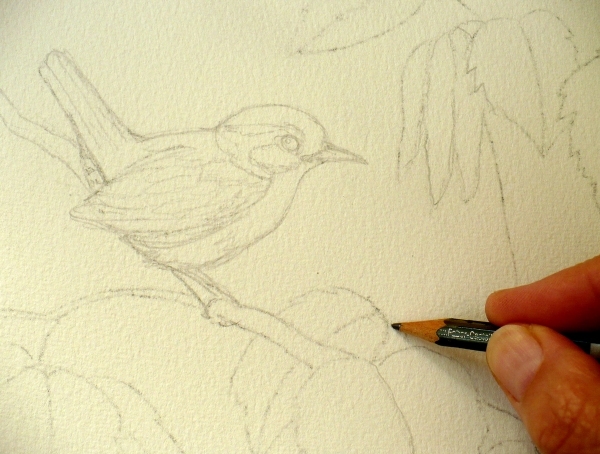 I start with a drawing on sketch paper and then transfer the drawing to watercolor paper when I'm happy with the composition. This allows me to make revisions and change my mind about placement without disturbing the surface of the watercolor paper with erasures. A fresh surface means sharper, cleaner edges. 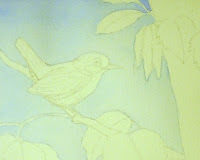 With this scene, I changed the position of the bird three times before I was satisfied. Next, I added blue washes to the background to denote the sky. Later, I may darken the upper sky areas with more washes of blue, but for now, it's enough of a background to judge the other colors against. The branches and leaves are done next. 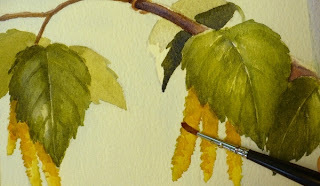 The client mentioned how much she likes the sawtoothed leaves of birch trees and the catkins that hang down, so I make sure to include them. Next I paint the wren. Since this is fairly close up, I can add in plenty of detail to the bird. You can click any of the images to see them larger. Here I'm adding background trees to the bottom of the painting. 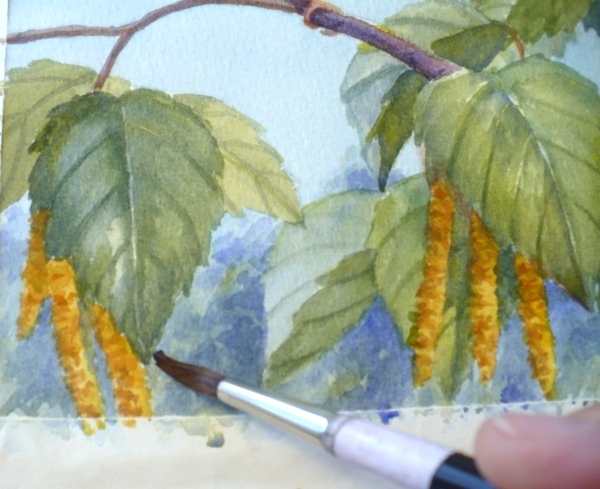 I use more blue, muted colors to make the background recede and the foreground leaves come forward. Blue is a cooler color than green. Cool colors recede and warmer colors advance. This is called "Aerial Perspective" which has to do with atmospheric properties. Next, I work on the birch trunks. 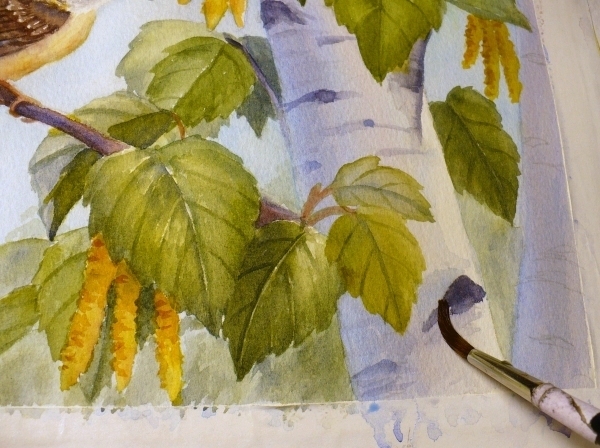 I've determined that the light is coming from the right, so I paint shadows on the left, let that dry, then paint in the details of the birch bark. After making a few more adjustments, the painting is finished. 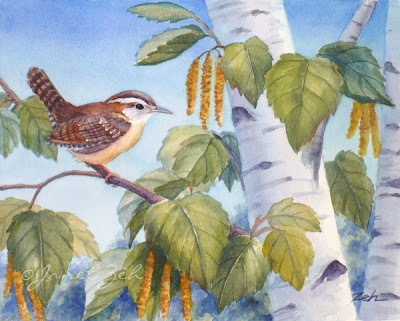 Way up high in a white birch tree, a little Carolina Wren enjoys a beautiful summery day. Thanks for stopping by. I hope you enjoyed the demo. 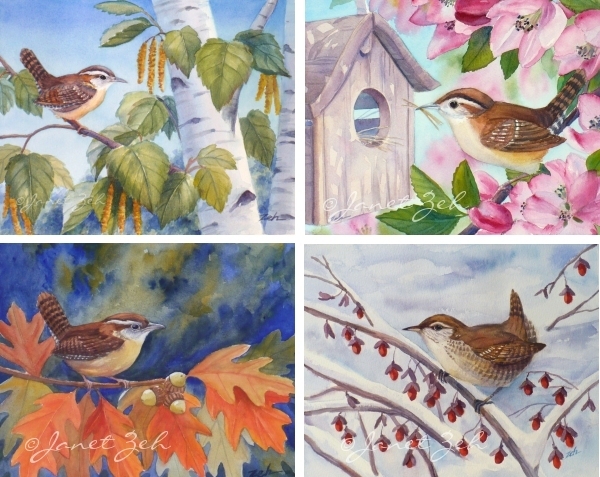 Below is the collection of four seasons of wrens. What a great idea my collector had, don't you think? You can find my bird prints in my Fine Art Prints Shop here. I'm happy to take custom orders! Contact me for a custom painting or to have a print made of a painting you like. To receive my posts by email, fill in your email address under FOLLOW BY EMAIL above in the right hand column and click Submit. You'll receive my posts in your email inbox at the end of each day that a post is made. Have a peace filled day! Thanks Beth! I appreciate your comment. Hope your day is full of peace and joy as well!